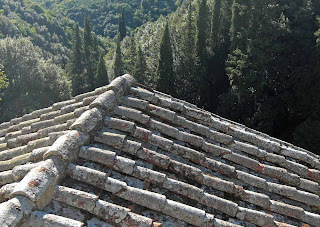 You can find roofs like this all over Italy. Sturdy but brittle, the curved tiles can endure for many years, slowly acquiring their sun-baked patina of lichens and minerals. If Hansel and Gretel had been an Italian fairy tale, I am sure that the witch's delicious house would have had a roof like this one, frosted just so. This roof looks out over the wooded hills near Le Celle where Saint Francis used to stay. An everyday asphalt roof may keep out the rain and wind, but it just doesn’t have the magic of an old tile roof.